Through a music scholarship to the University of Illinois at Chicago, Sharif gained valuable big band experience performing the repertoire of Duke Ellington, Count Basie, and Charles Mingus. This experience was exemplified by the group's performance of Duke Ellington's Sacred Concerts with the big band, full choir, and guest artist trumpeter Orbert Davis. While in college, Sharif also ventured to south side Chicago jam sessions hosted by legendary tenor men Von Freeman at the New Apartment Lounge and at Fred Anderson's Velvet Lounge. In addition to absorbing Chicago's strong and storied tradition at these sessions, he also gained bandstand experience with visiting national artists such as Roy Hargrove, Donald Harrison, Jaleel Shaw, James Cammack and David Wong. In October of 2010, Sharif moved to New York City to further his career and to study with the great drummer and teacher, Kenny Washington. He was heard at a late night jam session at Smalls Jazz Club by the legendary pianist and former Art Blakey and the Jazz Messengers member, Johnny O'Neal. "I was in the dressing room in back and heard this ride cymbal beat and had to come out and see who it was," explained O'Neal. 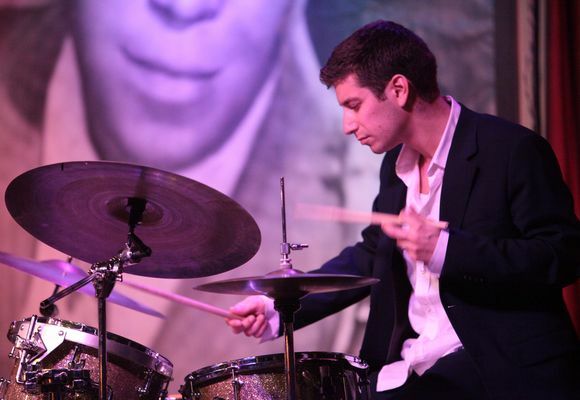 Johnny asked Sharif to join his trio and granted him his first NYC gig in February of 2011 at Smoke Jazz Club. For the following 2 years, Sharif performed in the Johnny O'Neal Trio every Saturday night at Smoke in uptown Manhattan and Sunday nights at Smalls in Greenwich Village. "It's a dream come true to play regularly with a master musician like Johnny," Sharif says, "And, every Saturday we'd play after one of my heros like Ron Carter and some of the best drummers in the world like Willie Jones III, Lewis Nash, Greg Hutchinson, and a few times after my teacher Kenny Washington." Sharif has also performed with the Johnny O'Neal trio at Jazz at Lincoln Center's Dizzy's Club Coca-Cola on numerous occasions. Sharif has recently become a member of piano genius Sacha Perry's quartet and can be heard playing alternate Thursdays at Smalls Jazz Club and freelancing throughout New York City. Booking inquiries can be made by email to sharif.zaben@gmail.com, by phone at 312.217.3377, or on his site www.SharifZaben.com under "contact."